The matcha ceremony is an elaborate art form that is an important part of Japanese culture. With a little practice, making delicious, clump-free matcha is simple and we'll show you how to perfect your whisking technique. Matcha powder, preferably ceremonial grade. Water, preferably distilled or purified. Chasaku (matcha scoop) or a 1/2 teaspoon measuring spoon. Chawan (matcha bowl) or any wide, shallow bowl. 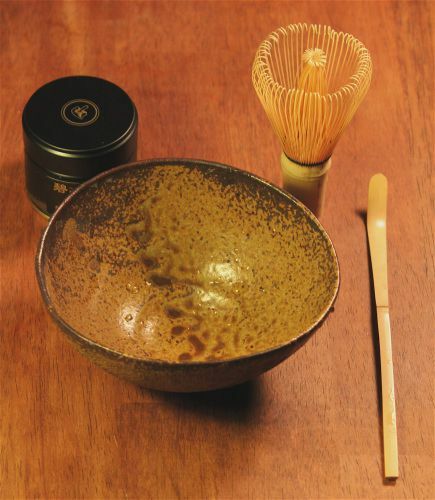 To do the full ceremony of making matcha, you will also need a linen cloth (known as a chakin) to wipe the bowl. You'll find it useful to have a matcha sifter (known as a furui) available as well. However, neither of these is necessary for the basic preparation of matcha. Matcha and the tools needed for the ceremony can be found at specialty tea stores and some markets that specialize in international foods. However, sometimes the easiest way to find all of your matcha supplies is online. You can buy ceremonial-grade matcha powder from companies like Art of Tea and DoMatcha. Many retailers also offer whisks, scoops, matcha bowls, and other accessories. If you find that you really enjoy matcha and the ceremony of making it, you might consider purchasing a handmade bowl. Many of Japan's potters have spent years perfecting this simple but challenging bowl and each has their own style. Heat about 1 1/2 cups of water to a boil, fill the matcha bowl 1/3 of the way with the hot water. Allow this to rest for 30 seconds, then discard the water and wipe the bowl dry. Place 2 scoops (or a heaping 1/2 teaspoon) of matcha powder into your bowl, preferably through a sifter or sieve. For thin matcha (Usucha): Use 2 scoops (about 1/2 teaspoon). For thick matcha (Koicha): Use 3 to 4 scoops (3/4 to 1 teaspoon). Pour 3 ounces (about 1/3 cup) of hot water into the bowl. Don't worry that this is not much water. Matcha is made to be drunk in small amounts immediately after it is whisked. Think of it as a concentrated dose of tea and remember that you are actually drinking the 'tea' itself. This is unlike ​a standard tea infusion in which the flavor is extracted and the tea leaves are removed. Water that has just begun to simmer is best for dissolving the matcha powder. Ideally, it should be around 160 to 175 F (70 to 80 C). By the time you're ready to whisk, that boiling water left over after cleaning the bowl should be almost perfect. Holding the bowl with your left hand and the whisk with your right hand, whisk the matcha powder into the water. Use your wrist (not your elbow or arm) to whisk the matcha in a gentle, circular pattern to loosen up any powder stuck on the bottom or sides of the bowl. Change to a rapid pace and make W-shaped whisking motions. Ideally, you also want to add air to the matcha and this is achieved with a controlled and fast speed. Place your hand over the top of the whisk as if you are cupping it. Your fingers should be just above the string which holds the prongs. Your fingers should be pointed down toward the bowl. Your wrist should be bent at a 90-degree angle. At some point during whisking, you will need to remove any clumps of matcha powder that remain. Run the whisk around the perimeter of the bowl to remove surface clumps. Also, gently press the whisk against the bottom of the bowl as you whisk to break up any hidden clumps. It will take thirty seconds to one minute to whisk out the clumps and develop a foam on top of the matcha. Once the top of the matcha is frothy, gently lift the whisk out of the center of the matcha bowl. This will leave a small, visually appealing concentration of foam in the center of the bowl. Drink and enjoy your matcha right away.